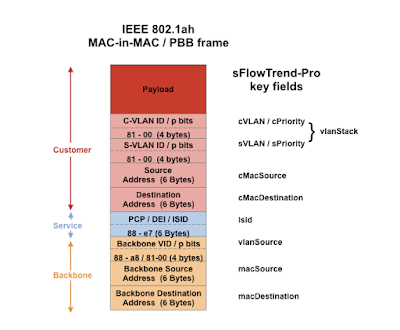 The Provider Backbone Bridges (PBB or MAC-in-MAC) standard IEEE 802.1ah defines an architecture and protocol that allows service providers to build large, scalable ethernet bridged networks, interconnecting multiple Provider Bridge networks without losing each customer's individually defined VLANs. It operates using a MAC tunnelling scheme in which a customer packet, including MAC addresses, is encapsulated in a new ethernet frame with new MAC addresses (the backbone bridge MAC addresses). This eliminates the need for backbone core bridges to learn all MAC addresses of every customer and provides complete separation of provider and customer domains. However, visibility of both the backbone traffic and the encapsulated customer traffic is important for troubleshooting configuration problems and managing performance. 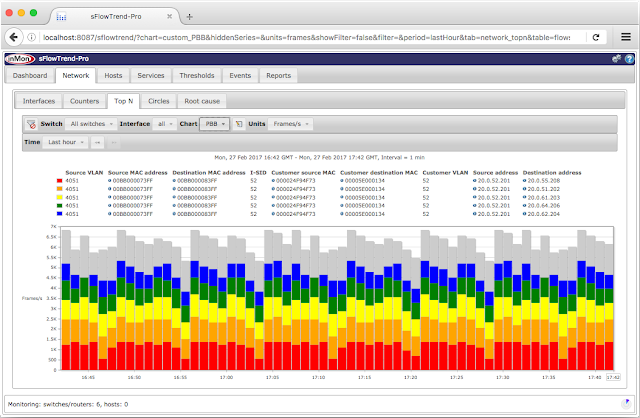 sFlowTrend (version 6.5 onwards) understands the IEEE 802.1ah frame format, decoding the outer backbone header and the inner customer frame. Here is an example of using sFlowTrend-Pro to gain full visibility of traffic in a PBBN. The diagram below illustrates a typical IEEE 802.1ah PBB frame and shows the key fields used by sFlowTrend-Pro to represent the header fields. The sFlowTrend-Pro help gives a full list of the MAC, VLAN, priority, and IEEE 802.1ah key fields. 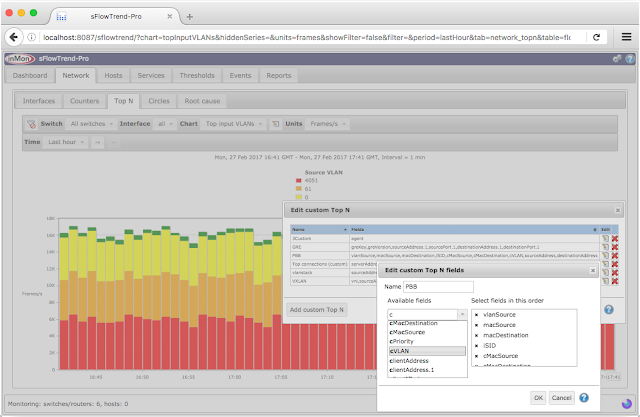 One way to view the details of traffic in a PBBN, is to use the Network > Top N tab and create a custom top N chart. In this example we have build a custom top N chart showing the backbone header fields and the MAC and IP addresses and VLAN in the customer frame. Selecting this custom top N chart from the Chart selection list, generates a chart showing the details of the PBB traffic.